We are a family-run business located on Salt Spring Island, B.C. We are passionate about our work and our lives outside of work, always aiming to contribute toward a sustainable and beautiful world in which our children can grow up. In this fast paced culture, we believe in the necessity of slowing our lives down. For us, our skeletons are not just about building scientific and artistic collections, these projects are about creating an emotional experience, fostering awareness and providing an opportunity to experience the amazing form and function abundant in our natural world. We are thrilled to give others the opportunity to be awed by nature's design. To experience a sea lion's underwater grace; to actually stand next to the largest animal known to have lived on the planet - ever! Each skeleton has a story - one which gives us a glimpse into the world in which they lived and the pressures threatening these systems. We hope that our skeletons will contribute toward a legacy of lifelong learning, inspiring children and adults to live with a real awareness of the natural world and a passion for protecting it. Michael deRoos is a master skeleton articulator, biologist and accomplished builder. All of his work is distinguished by the ability to fuse his unique talents in the arts, science and the trades. During his undergraduate education, Michael articulated his first skeleton, a sea otter now located in the whale lab at the Bamfield Marine Sciences Centre. 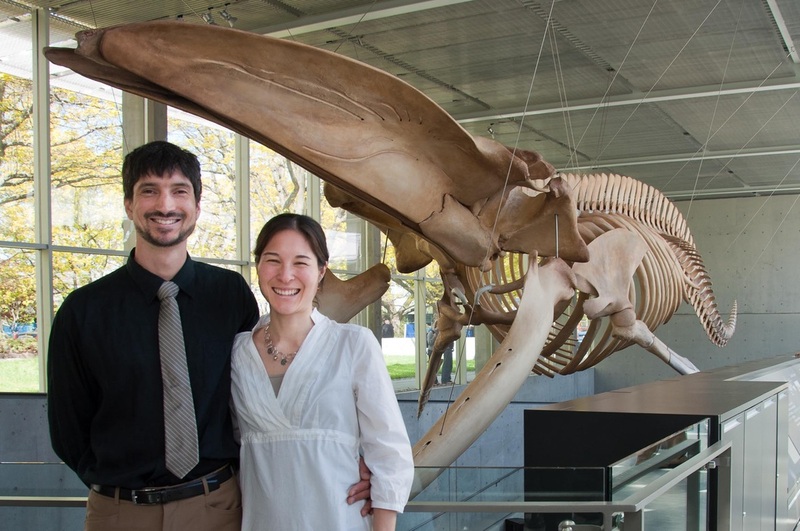 He began articulating skeletons mostly full-time in 2004 and has since worked on numerous skeleton projects, including three really big blue whales. In his limited spare time, Michael also works as a marine mammal field technician, a builder and a welder/fabricator. When not up to his armpits in dead animals, working with bones, fixing something or building strange and wonderful things in his workshop, Mike probably cannot be found as he is undoubtedly out sailing, climbing or hunting deep in the woods. Michiru Main has a background in marine ecology and conservation biology. Over the past several years, her less stinky work has been in the fields of education, marine interpretation, research and wildlife policy. Michi has been working with Michael since 2007 as project manager and assistant articulator on various wild and wonderful skeleton projects. Michi is passionate about sharing her love for natural history, especially through mentoring in nature connection and bird language. She has also worked as a mentor for programs run by Wisdom of the Earth, a wilderness and nature connection school on Salt Spring Island. When not engaged in one of these awesome jobs, she's likely to be on the go somewhere outside.